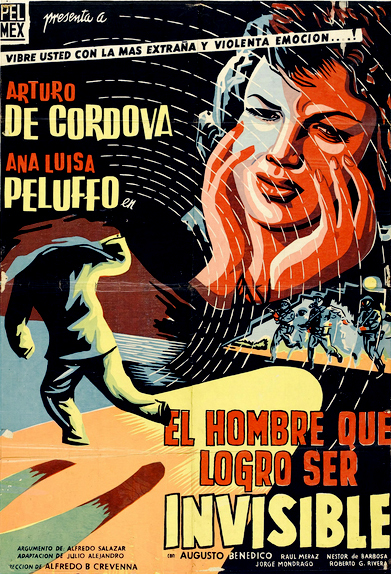 I love, love, love the Mexi-horror flicks made by Azteca Films in the 1950s and ’60s – black-and-white wonders with cool monsters, chilling music, ridiculously styled sets, curvy brunettes and the occasional weirdness that lost-in-translation moments alone can yield. We all know the biggies: “The Vampire,” “The Vampire’s Coffin,” “Robot vs. the Aztec Mummy,” “Santos in the Wax Museum,” “Doctor of Doom.” But I recently scored a muthaload – well, seven movies – of Mexploitation masterpieces, five of which I don’t believe ever made it to this side of the Trump Wall. The hero guy gets ready to disappear. Even though I can’t ascertain the finer points of the storyline, I can still follow these movies. Mexi-horrors communicate in an international language well known to we horror-movie geeks. 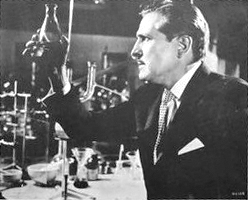 The film was directed by Alfredo B. Crevenna, who also helmed “Cry of the Bewitched” (1957), “Bring Me a Vampire” (1963) and “Neutron vs. the Maniac” (1964). Dr. Shock once showed “Cry of the Bewitched,” which I remember as the worst horror film I’d ever seen — and I was only in seventh grade. I am dying to see it again. 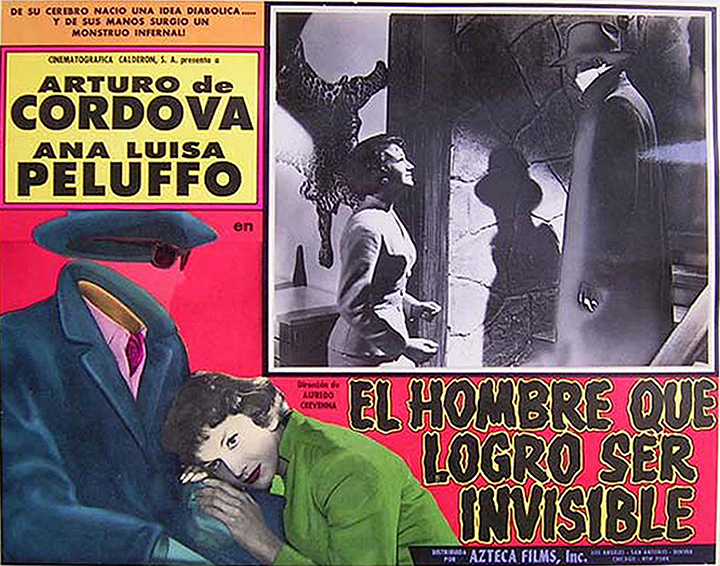 The plot of “El Hombre Que Logro Ser Invisible,” as much as I can make it out, has the hero guy planning a future with his fiancée. (I can’t get more specific than that, because I can’t make out the character names.) The man looks like a drinking, smoking, pomade-wearing 55. (This was back when 55 was the new 65). The woman looks like a lithe, lovely 29 or 30. Their plans are shaken when the man is framed for the murder of a colleague. But thankfully, the good guy’s brother happens to be a scientist who is at work on an invisibility formula. The scientist bestows invisibility upon a cockroach, then a rabbit, and finally his own brother. The unfairly convicted, newly invisible man then escapes to take revenge on his tormentors. There are some cool “in your mind” FX. The invisible man foils a pickpocket on a bus, who then drops to his knees in prayer. During a tense manhunt, a detective uses a bullwhip to locate the invisible man. When the invisible man finally re-materializes, we first see his skull — an apparent homage to Claude Rains’ death scene in James Whale’s 1932 original. Made in Mexico, baby. It means good things.